This is my favourite recipe from Jodeli with minor changes. Preheat oven at 180 degC. Sift flour, baking soda and cocoa powder into a mixing bowl and put aside. Whisk egg yolks and castor sugar till sugar dissolved, add oil and milk to the egg mixture and stir till blend. Add the flour mixture and gently mix until just combined. Add more milk if the batter is too thick 1 tbsp at a time. In a separate mixing bowl, whisk egg whites with cream of tartar at medium speed until formy. Add sugar and continue to whisk on high speed until soft peaks form. Turn to medium speed and whisk until stiff peaks just form. Use a large spatula to fold 1/3 of egg whites into egg yolk mixture. Fold gently to not deflate the egg whites, then add the remaining egg whites to the mixture and gently fold till well combined. Pour batter into a 8 inch round cake pan which has been lined. Do not grease the sides of the cake pan. Bake at preheated oven for 40-50 minutes or until skewer inserted into centre of cake comes out clean. Remove cake from oven. Invert cake pan immediately on a wire rack and let cake cools completely before turning it out of the pan. Once the cake is cooled, cut into 3 layers. Brush each layer with the syrup from the dark pitted cherries. 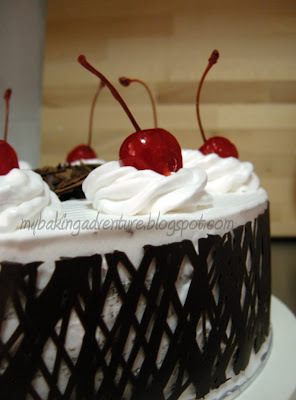 Frost the layer with whipped cream and put a few pieces of cherries and place the second sponge layer and brush it with syrup and top it with whipped cream. Place the remaining cherries on it and cover it with the third layer. Frost the sides and top with the remaining whipped cream and decorate with maraschino cherries and chocolate shavings or rasps. Did you make your own chocolate lattice?